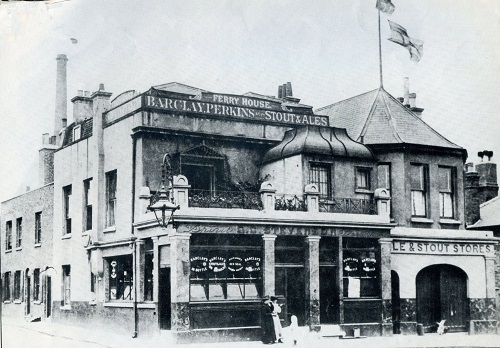 In the 18th century there were very few houses on the Isle of Dogs, one notable exception was the Ferry House pub which has been plying its trade since 1722 and is still going strong. 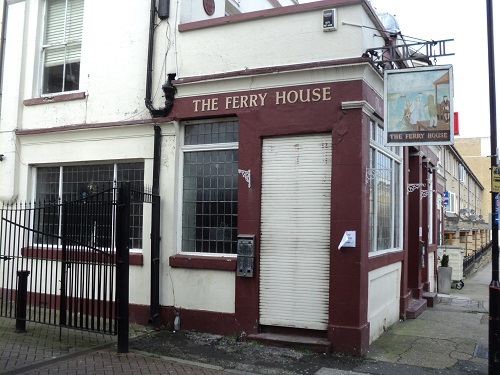 The pub’s location near to the old ferry point across to Greenwich meant it was ideally placed to cater for travellers crossing the river. There had been a ferry at this point since at least 1330, known afterwards as Popeler Ferry and then Potter’s Ferry. The Ferry transported men, horses and cattle and become a lucrative business whose rights were protected by legal statutes. We know from Rocque’s map of 1745, that the Ferry House was marked on the map near to a gibbet, by consulting Old Bailey cases we can often find a little bit of the history of who was the landlord and the type of customers that frequent the pub. From the following cases it is clear that the pub’s isolation attracted a number of interesting characters. In a case from 1764, a John Mather living at the Ferry House is suspected of Theft. JOHN MATHER, Theft > receiving, 12th September 1764. JONATHON SAUNDERS . I am a corn-lighter man : about the 3d or 4th of May, I missed 8 bushels of malt from out of my vessel lying at Pickle-herring-stairs ; it was clean good malt, worth 27 s. the quarter; that was the lowest it was sold at, at that time: the prisoner Mather did live at the Ferry-house at the Isle of dogs: we went down to apprehend him on the information Dimmock had given us, when we took him at Portsmouth. When I charged Mather with buying a quarter of malt, my property, he said he might have had sweepings of him; but he did not brew, and had no occasion for malt at all; he threatened what he would do to us; but we took him in a boat, and brought him before justice Clark; we had Dimmock there: the prisoner owned he had bought some malt off three men, but said it was sweepings; and said he never bought any clean corn off them. 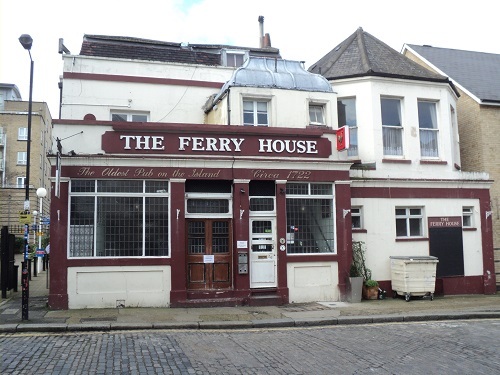 In 1834, the Ferry House featured in another theft case. ELIZABETH PINKERTON, Theft > pocketpicking, 3rd July 1834. JOHN BURT. I am a seaman . I met William Punchard on the 10th of June, at the Ferry-house, in the Isle-of-dogs – I gave him my watch to take care of – I was going over to Greenwich – it was an old-fashioned silver watch, and the maker’s name was Brown – it had a steel chain, a seal, and a key. WILLIAM PUNCHARD. I received the watch, and as I was returning home that night, about half-past ten, I met the prisoner and another woman – they asked me to go with them – I went to a house in Limehouse-hole – I went to an up-stairs room with both the women – I laid on the bed, and went to sleep – I had given them four shillings between the two – I awoke about two o’clock, and missed the watch which had been in my fob – I had pulled my jacket, off, but my trowsers were on – I opened the window, and sung-out for the police – the prisoner was gone – the other woman was there – she was taken, but discharged. Cross-examined by MR. BODKIN. Q. Your friend asked you to take care of his watch? A. Yes; I had been drinking a little when I went with the women; but I was not drunk – I had been in one public-house, and stayed about half-an-hour with a young man who is now just gone in to Sydney – after I left the public-house, I had to call at a doctor’s – I had the watch safe then – that was about one hundred yards before I met the women – the prisoner laid on the bed; the other woman on the floor – I had been in the house about half an hour when I fell asleep. GUILTY . Aged 34. – Transported for Fourteen Years . In 1838, the landlady Amelia Ingram recollects some decidely shady dealings. THOMAS PAUL, Theft simple larceny, 14th May 1838. AMELIA INGRAM . I keep the Ferry-house at the Isle of Dogs, near the Mill-bank. Some time about twelve months ago I remember four men coming, and giving me information that a dead man was at the back of my house in the water—the prisoner was one of the four—he is a navigator, and was working in the neighbourhood—he was in the habit of coming to my house for beer—I knew nothing of the deceased, nor his property. Cross-examined by. MR. PAYNE. Q. Was the prisoner the person that spoke to you about it? A. No, another man—it was on, a Monday morning—I am sure it was not Wednesday—it was about half-past eight o’clock or ten minutes to nine o’clock—the persons went away together afterwards COURT. Q. You say four of them gave you information, and he was one of them? A. Yes—two of them came to the kitchen door, and two stood down the steps—he was one of the two that stood on the steps. In 1851 we have the landlord Robert Shepherd cashing a dodgy cheque. WILLIAM JOHN COLLIER, Theft > embezzlement, 3rd February 1851. ROBERT SHEPHERD . I keep the Ferry-house, at Poplar—the prisoner brought me this check, and I cashed it for him—I afterwards paid it away. GUILTY .—Recommended to mercy by the Jury— Confined Eighteen Months. The pub’s relative seclusion meant it was often a well known sight from the river and in the following newspaper report from 1832 was considered isolated enough for some bare knuckle fighting that had tragic results. On Wednesday night, an inquisition was held at the King’s Head, Church-street. Deptford, before Joseph Carter, Esq Coroner. and a respectable jury, on the body of Richard Dodd, aged 27 years, who was killed under the following deplorable circumstances. The deceased was a shoe-maker, and resided in Whiteheart yard, Coleman street. A month since, a match ‘was made between him and a man named James Cox, a shoemaker, at the Crispin public-house Milton Street to fight for two sovereigns, and Monday last was fixed for the fight. The two men dined together at the house of the deceased, and were quite friendly. After dinner they, with a host of their partisans proceeded to Battersea fields, where they fought 17 rounds, but being disturbed by the new police, the seconds proposed that they should proceed to the Isle of Dogs to terminate the fight. Thither they went, and a ring was formed near the Ferry House; but before the men set-to, they expressed a wish to draw the stakes,-and shake hands. The stakeholder, a man named Jordan, refused to give them up, saying, the money was placed in his hands for the them to fight, and he would be dead if they should not. Many persons, and the men themselves, remonstrated, but he and the seconds were inexorable, and the men then commenced fighting. Several blows were given on both sides, and the friends of Cox cried to him ” Kill him, murder him.” After about 14 rounds, both men fell insensible to the ground, and were unable to come to and they lay on the grass to all appearance dead. Dodd was carried in a boat to the Grampus hospital ship where he was attended to by Dr Lawson, and every thing that was possible was done to restore animation, but all to no purpose, and he expired in about an hour after. Cox was conveyed home in a dying state in a coach and the news arrived at the inquest-room, on Wednesday night that he had also expired. Several witnesses were examined , but they were unable to identify any of the parties engaged’ in the fight, with the exception of one man named Green, who held the clothes of the deceased He was apprehended and carried to the cage at Deptford ; the others have at present escaped. Dr Lawson stated that he had made a post mortem examination of ,the body, which was most frightfully disfigured and found upwards of three ounces of coagulated blood on the brain, which was the cause of death. At 11 o’clock, the Jury came to a determination to adjourn for further evidence to Friday, and the Coroner issued warrant against the seconds and Jordan the stakeholder, to enforce their attendance. The deceased persons were married men, and have left families to deplore their untimely death . Towards the end of the 19th century, a large number of industries covered the southern tip of the Island and the population increased to take advantage of the employment. 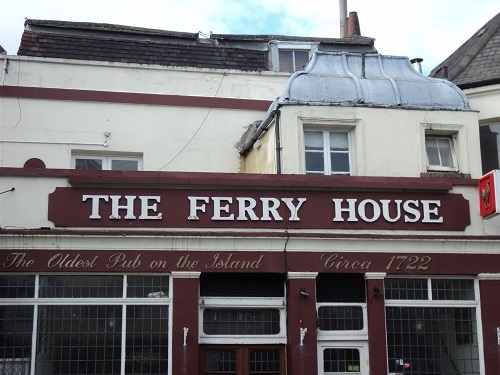 The Ferry House was not so reliant on the Ferry Trade but began to cater for the large number of workers coming onto the Island. The building of the foot tunnel virtually killed the ferry trade altogether, and the Blackwall and Rotherhithe tunnels began to be used to ferry vehicles across the river. In the 20th century, it’s colourful past was largely forgotten and the Ferry House’s location near the foot tunnel and Island Gardens allowed it to prosper and was fortunate to avoid damage in the Second World War. The Ferry House is, it is safe to say the oldest pub on the Island, but it is probably the oldest building on the Island that has been in continual use. It has also had its share of fame, featuring in a number of novels based on the Island.